Unlike most genera in the Oleceae family, which have four corolla lobes petals, Jasmines often have five or six lobes. Jasmines are often strongly and sweetly scented. Jasmine is widely cultivated for its shining leaves and beautiful clusters of fragrant flowers. Flowering in Jasmines takes place in summer or spring, usally six months after planting. The Jasmine flower releases its fragrance at night after the sun has set and especially when the moon is waxing towards fullness. Jasmine flower buds are more fragrant than the flowers. There exists a true Jasmine and a false Jasmine, and the two are commonly mistaken for each other because of the fragrance the plants release. The true Jsmine belongs to the family Oleaceae, is primarily a bushy shrub or climbing vine, and is non-poisonous. True Jasmine has oval, shiny leaves and tubular, waxy-white flowers. The false Jasmine, on the other hand, is in a completely different genus, Gelsemium, and family, Loganiaceae, is considered too poisonous for human consumption. Jasmine shrubs reache to a height of 10-15 feet, growing approximately 12-24 inches per year. The variety Jasminium sambac, is a clustered flower of a equally strong scent known in Hawaii as the Pikake. In China ,Jasmine is used a symbol of feminine sweetness and beauty. Jasmine also symbolize deep affection, happiness and elegance. This is why it is used in wedding toss. Jasmine has astringent properties which aids in treating inflamed eyes and skin, and as a gargle to relieve sore throats and mouth ulcers. 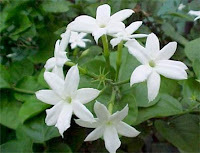 Jasmine is used in aromatherapy to calm the emotions, and as an aphrodisiac. It is a valuable remedy in cases of depression because is produces a feeling of confidence , optimism and euphoria. It revitalizes and restores the balance of energy.